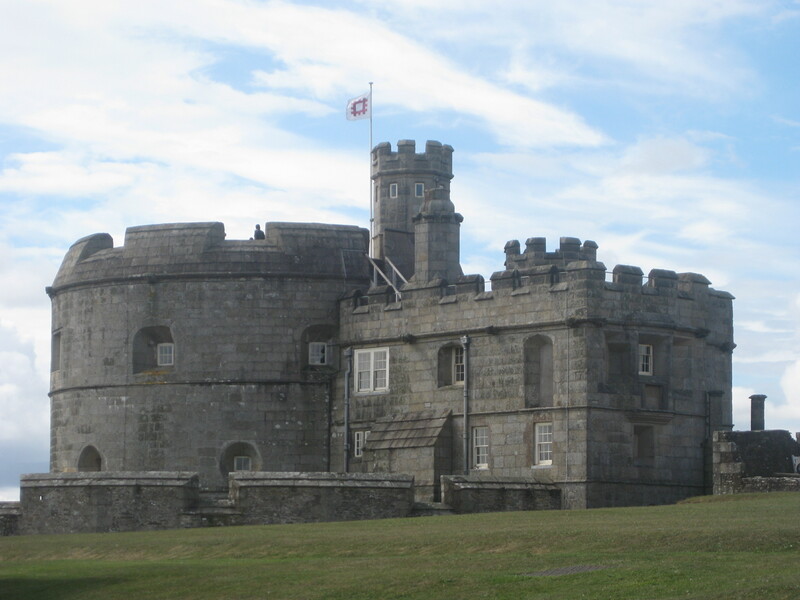 Ever since my aunt and uncle moved away from the north east to the far away land of Cornwall, I have yearned to visit. Just about all of my other relatives have made their way there for a holiday and shared beautiful pictures, but it’s taken 14 years for me to make the journey. My fellow and I decided that, before we flee this beautiful country, we should try to see a few more places in it, so we hatched the long awaited Cornish plot. On the way down south we stopped at Stonehenge, where a previously bright and boiling day instantly descended into an intense downpour. How typically British. It was expensive and full of people, but worth seeing. 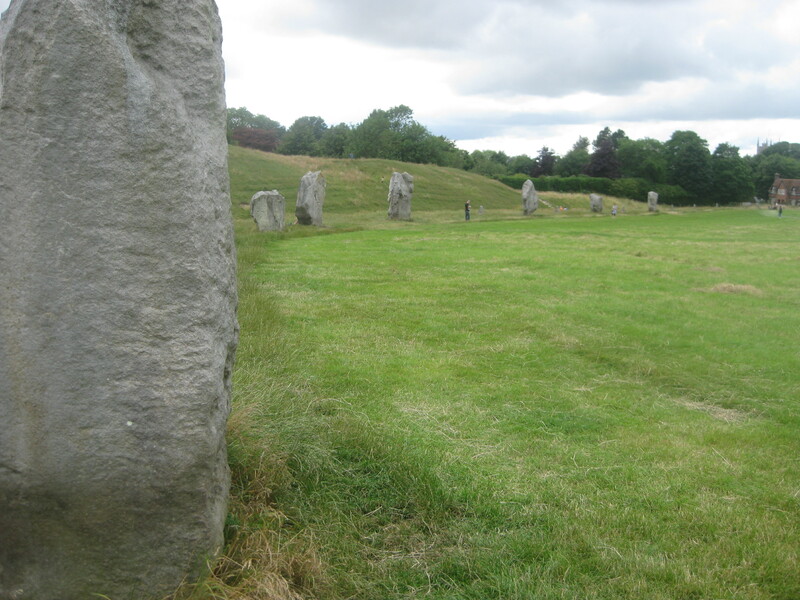 More impressive, in my opinion, was the nearby Avebury Stone Circle, which was free, not roped off, and scarcely signposted, so that you’d have to know about it to find it. 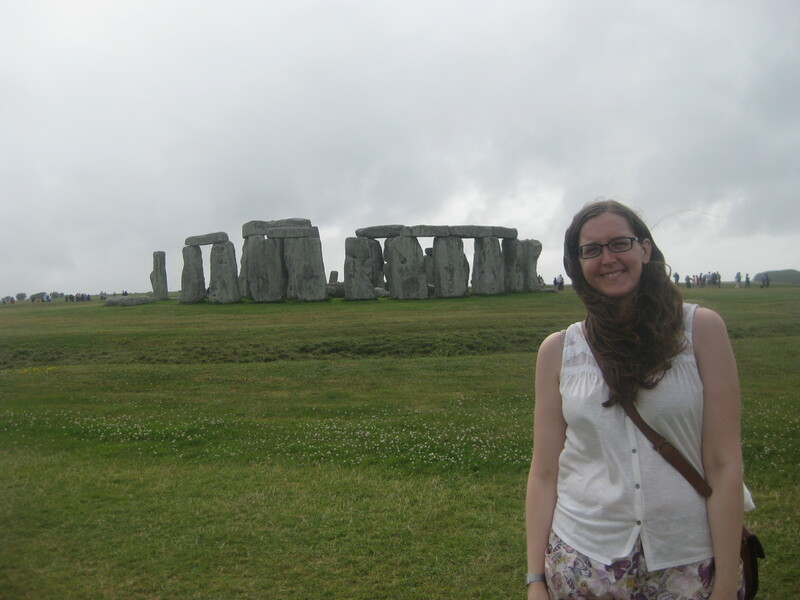 We were in a hurry as we’d pre-booked our Stonehenge timeslot and the M6 had been most unobliging, but it would be an ideal place to take a picnic and idle away an afternoon. 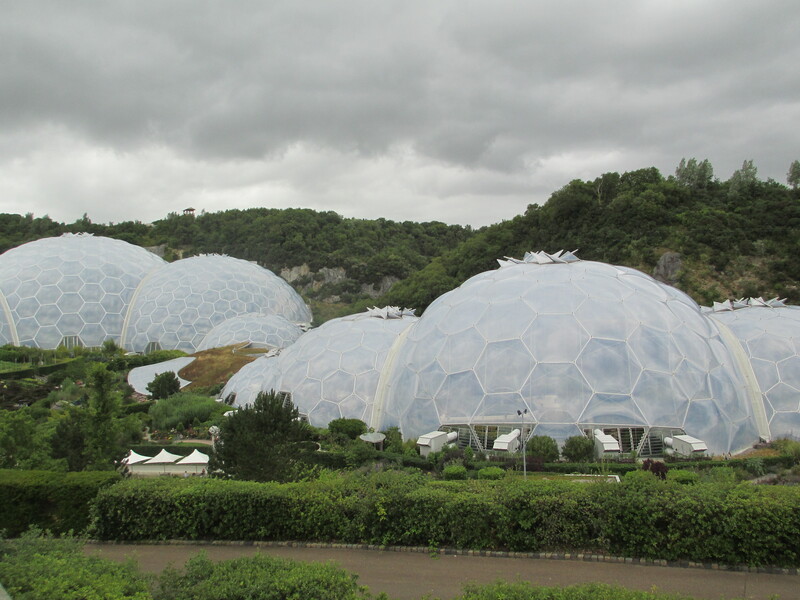 Our first stop in Cornwall was at the Eden Project, which was quite a last minute addition to our itinerary as I’d heard mixed reviews, but was worth it for the rainforest biome alone. It was hot, humid and full of wonders. 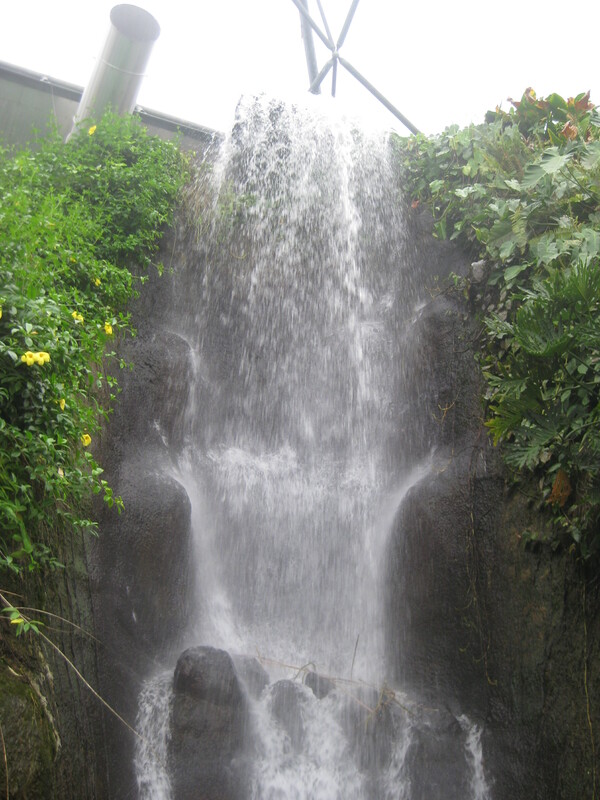 Standing in the spray from the waterfall was welcome relief! 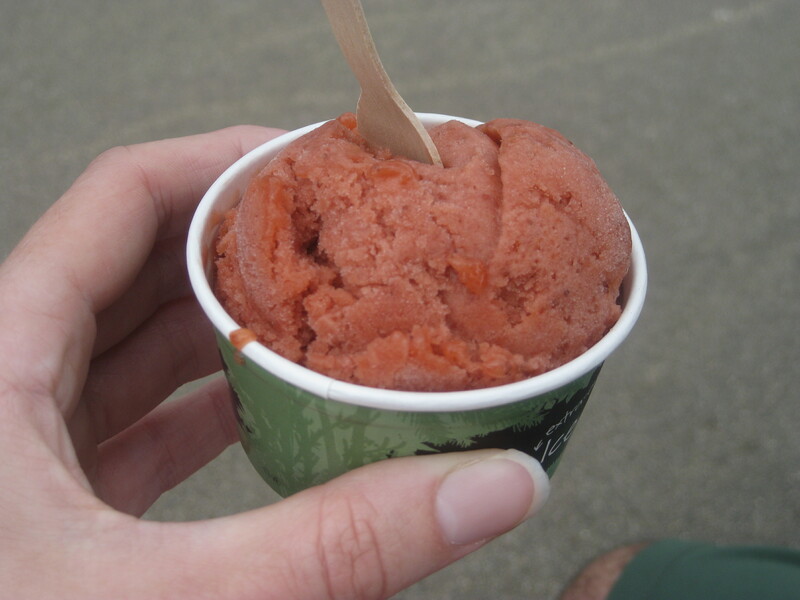 After that heat, we rewarded ourselves with ice cream: I had this strawberry sorbet, which is such a lovely natural colour that I was very impressed. It was refreshing and tasty! We did finally make it to my relatives’ home in Newquay, but after an initial stroll, didn’t do any more exploration there. I’d expected Cornwall to be a vegan haven, as I imagined it to have quite a laid-back, hippyish reputation that would go hand in hand with veganism. However, I only found one 100% vegan establishment there, so Wildebeest(UPDATE: closed in spring 2017) in Falmouth was our first destination, and a welcome opportunity for a reunion with a friend. It definitely didn’t disappoint! My friend, having her first ever vegan meal (or knowingly vegan anyway – I’m sure everyone’s had an accidentally vegan falafel meal at some point), really got into the spirit and ordered the raw pad thai. 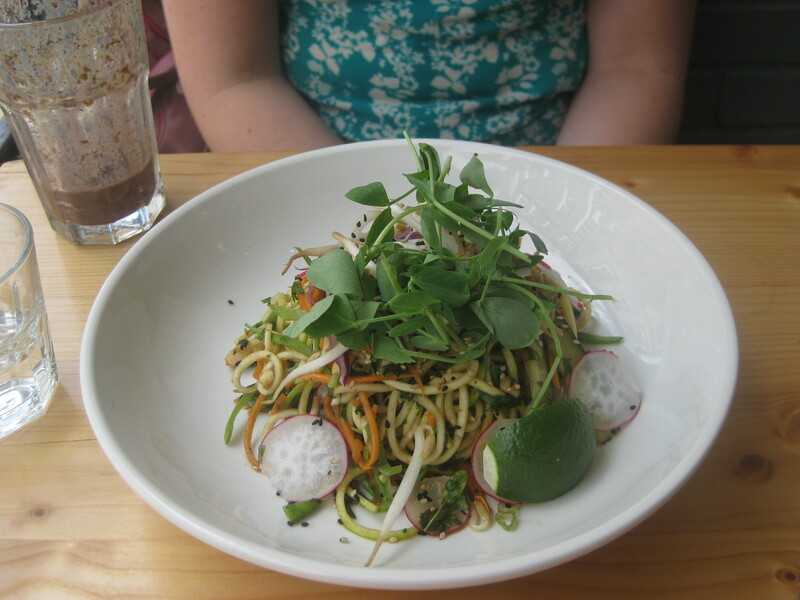 The noodles were made of raw courgette, and she said the dish was tasty and filling. It certainly looked fresh and inviting. My fellow ordered this rather exciting-looking concoction of polenta with glazed beetroot, roasted celeriac and broadbeans. 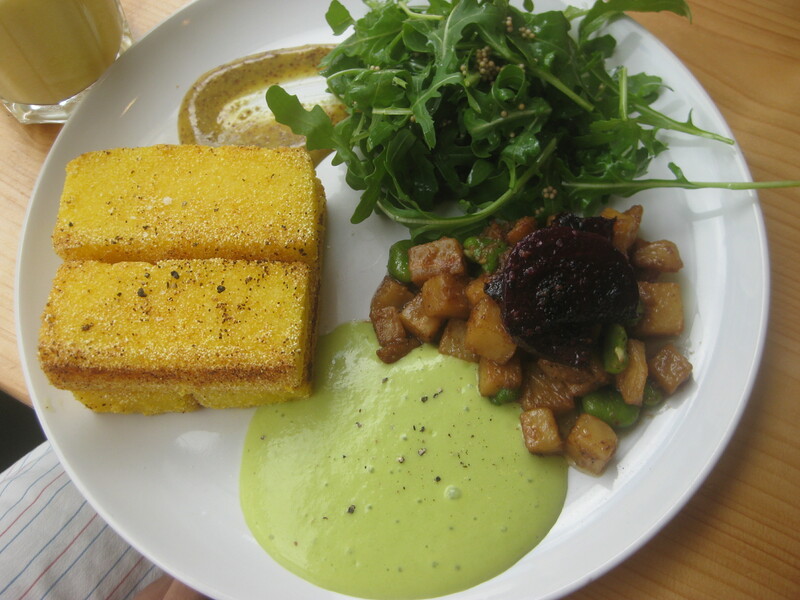 His verdict was that everything was good, especially the polenta and the sharp mustard mayo. However, the menu listed a wasabi foam as one of the components (we were on a Celebrity Masterchef catch-up at the time, and he thought himself quite the fine diner when he saw it on the menu), but as you can see, it was more of a cream, and he said it was not as strong as he would have liked. I was a bit of a maverick and ordered two starters for my main, mostly just because I really, really wanted the sushi. 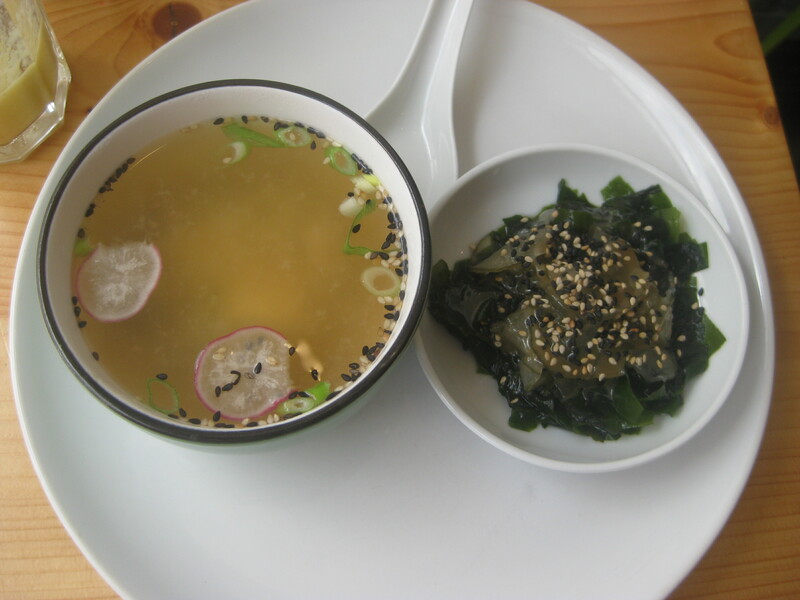 The miso soup was good but unremarkable. The seaweed was gorgeous! And the sushi was amazing too, exactly what I’d hoped for. 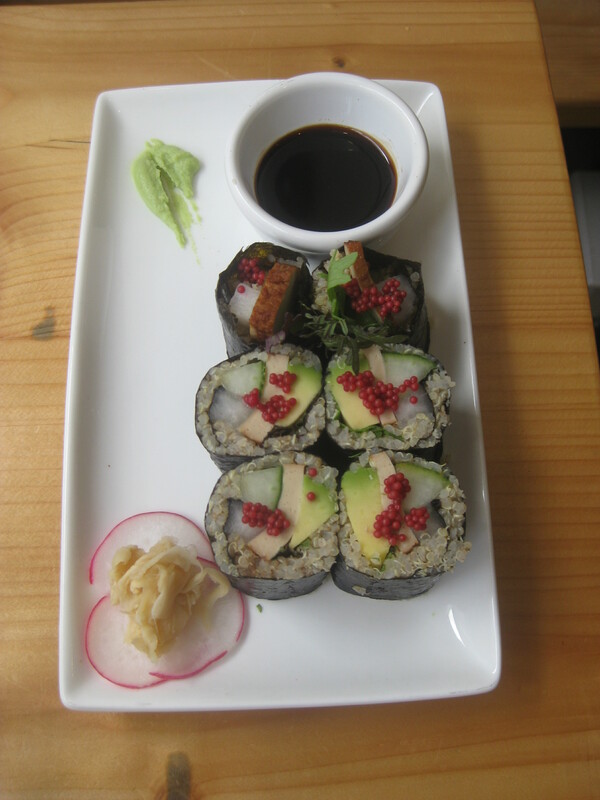 The rolls were stuffed with quinoa, smoked tofu and avocado, and I don’t know what the miniscule red berries were, but they were really nice. Of course, we all had to have desserts as well. Everyone was happy with their choice, but I definitely felt like the winner with this cherry and vanilla cheesecake. 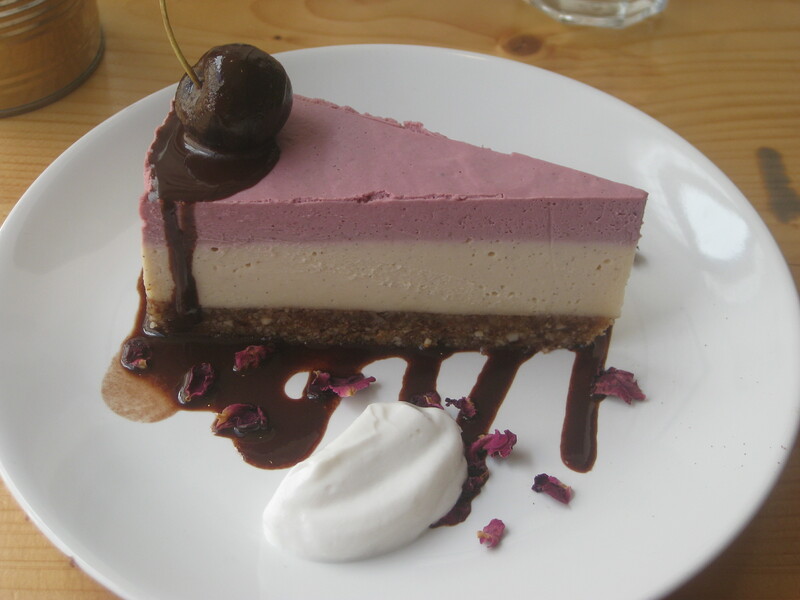 Sometimes cherry-flavoured desserts are clearly artifically-flavoured, but this one was lovely and natural, both in colour and taste. Everything tasted fruity and coconutty (the chocolate was especially coconutty, which was a nice twist), and the texture was perfectly creamy. I was extremely disappointed when Mr HH ordered the chocolate espresso torte, as I love sharing his desserts but hate coffee. Fortunately (for me – he found it rather disappointing), the coffee flavour was extremely subtle and it was more of a chocolate torte. Again, it was creamy and delicious, though for fans of coffee it might not quite meet your standards. 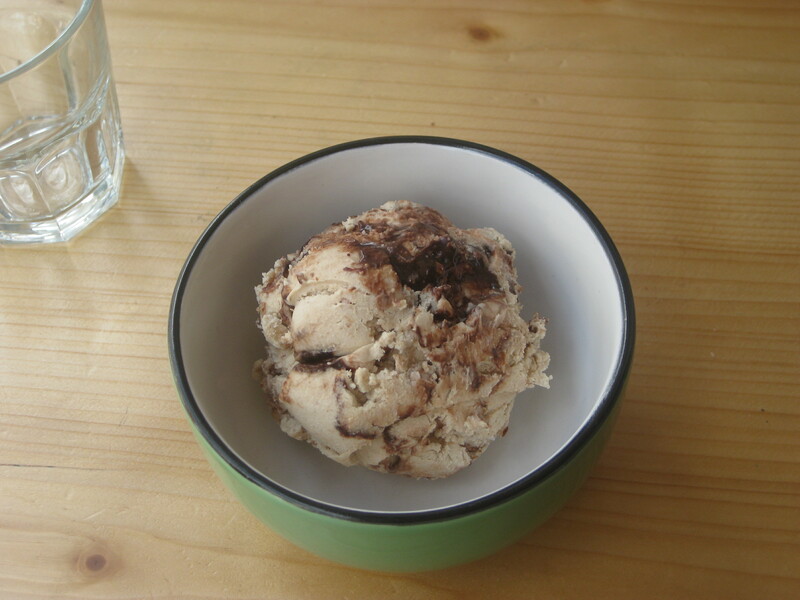 And my friend chose the most tempting of the ice cream flavours: peanut butter and chocolate fudge swirl ice cream. 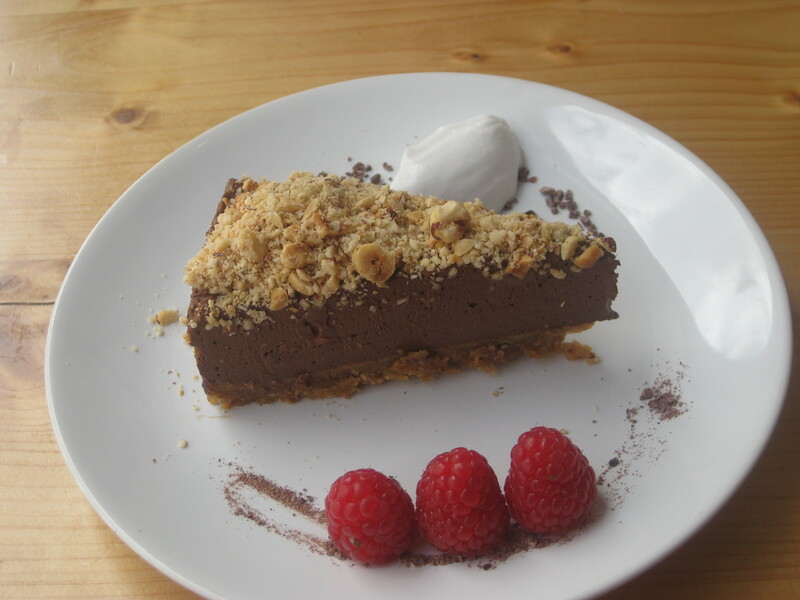 From the little taster I had, it was decadent and delicious and tasted like a Snickers bar. I can’t recommend this place highly enough, the food was beautiful and the service was great. It’s quite a small place though, so booking is advisable. 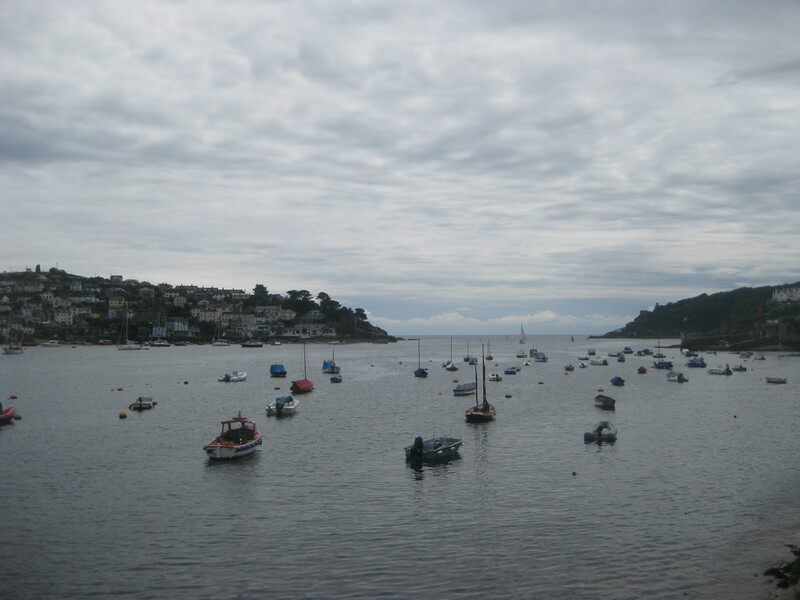 As it was Cornwall, what choice did we have but to go for a pasty as well? Happy Cow listed King’s Pipe Pasties as having vegan options, but I’d forgotten to write down the address. 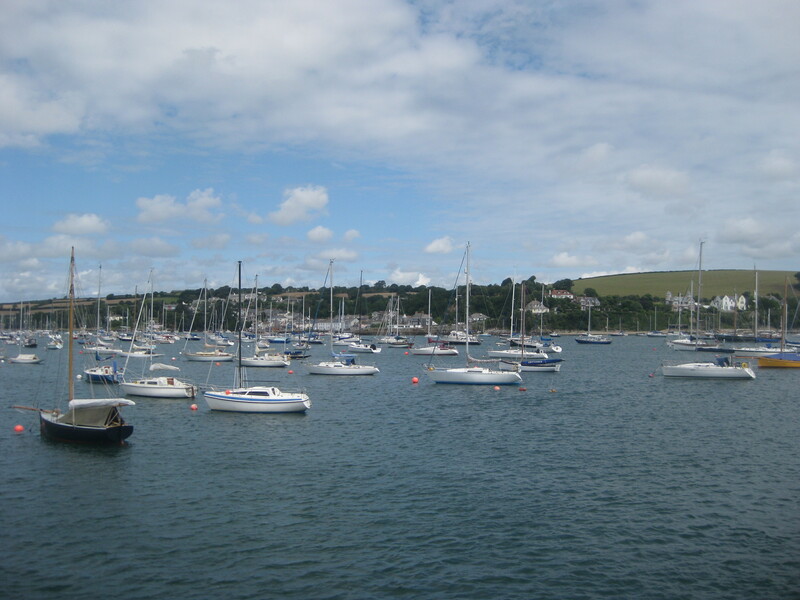 Fortunately, it’s right by one of the little docks for boat trips and while we were scoping out the ferry to St Mawes we stumbled upon it. On the menu board outside, the vegetarian and vegan options were clearly marked. 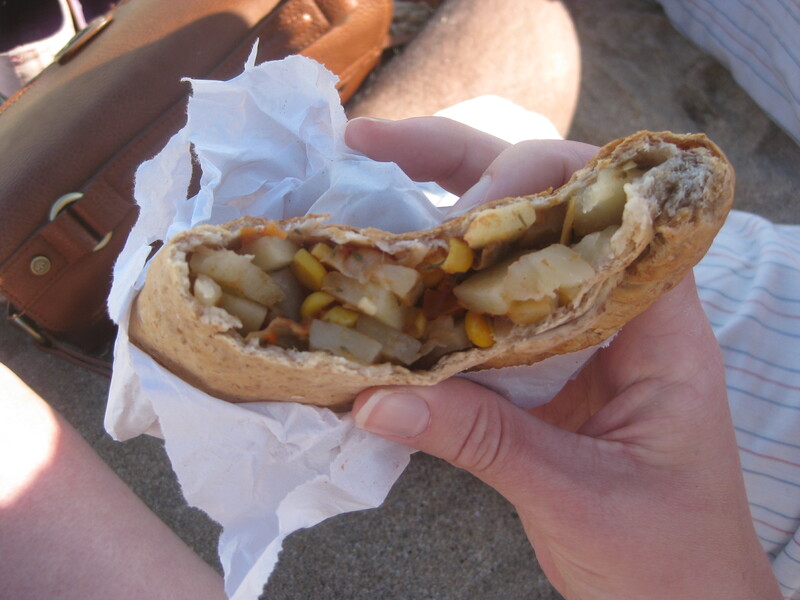 There was only one vegan pasty, so I took that and we kept it for later when we were reclining on the beach in the sun (and what a beach it was – I grew up a two minute walk from the North Sea, but this was something else altogether. 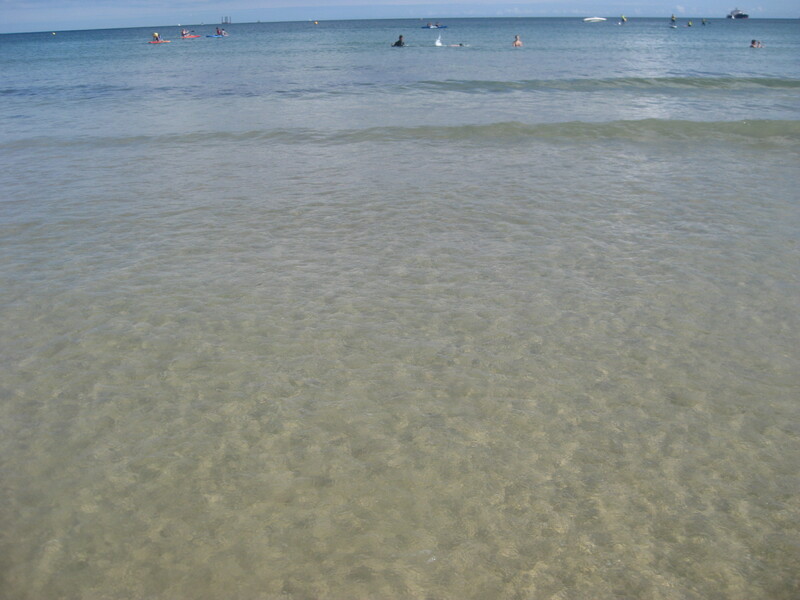 I didn’t even know clear water existed in the UK! ), sheltering our food from the greedy seagulls. It was a good pasty: the pastry was lovely, and the crimped edge was great (I’ve predominantly eaten Greggs pasties before – this was much better). It was filled with onion, potato, carrot and pepper, and probably more veg that I didn’t identify in my greed. It was really nice not to miss out on this Cornish staple. 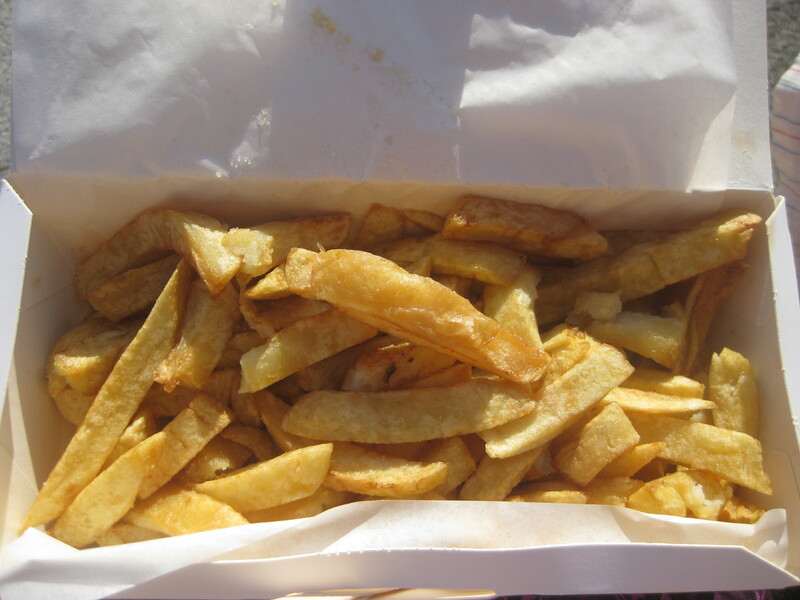 As we were by the sea, we also simply had to have some chips. As we wandered past Harbour Lights, just round the corner from the pasty shop, we saw a sign saying that all their chips were fried in vegetable oil, so we decided to treat ourselves. It was £3.10 for this large portion, which was a bit steep, especially as they weren’t well-seasoned enough for our liking. Nevertheless, it was nice to sit in the sea air and eat some chips! 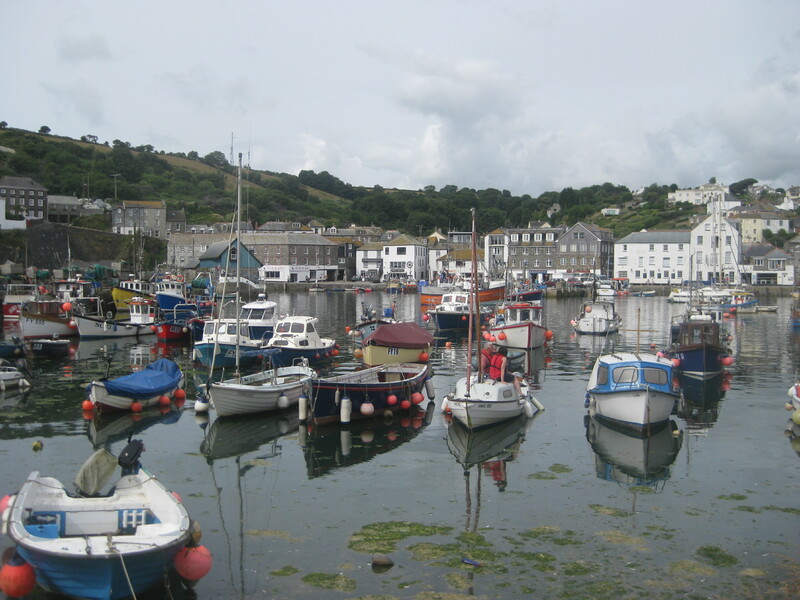 The next day my fellow took a break from driving and my aunt and uncle guided us around some of the smaller villages in Cornwall: Mevagissey, Fowey and Padstow. It really is easier to see Cornwall by car than public transport, which is a disappointment to me, but it was great to get to see so many places. We had lunch at one of my aunt and uncle’s favourite places, The Polgooth Inn. 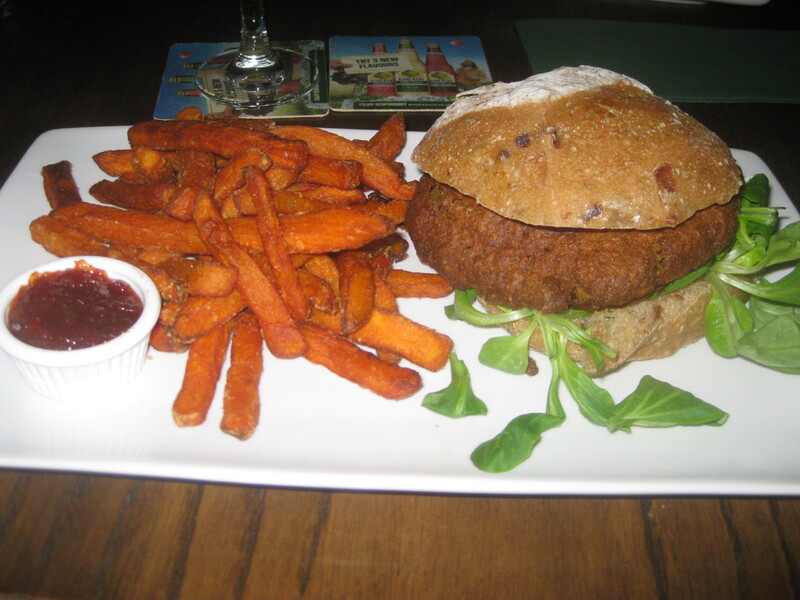 Before the holiday I’d sent them a quick email to check if their falafel burger would be vegan without the blue cheese listed on the menu, and they confirmed this and said they would put on an extra vegan special for me if I let them know when we were visiting – what a lovely touch! The special was a stir-fry, but I went for the burger anyway. I don’t think the picture quite does justice to the sheer size of this monster: it was HUGE! The sweet potato fries and chilli jam were both good and flavoursome, but I couldn’t even finish them because the burger took it all out of me. It was so crispy, and really nicely spiced – it was good pub grub, and it was ginormous. There were a couple of sorbets on the dessert menu that I would have liked to have tried, but honestly, I couldn’t eat again for the rest of the day. I would always prefer to give my money to 100% vegan establishments, but I love the fact that they were so accommodating. 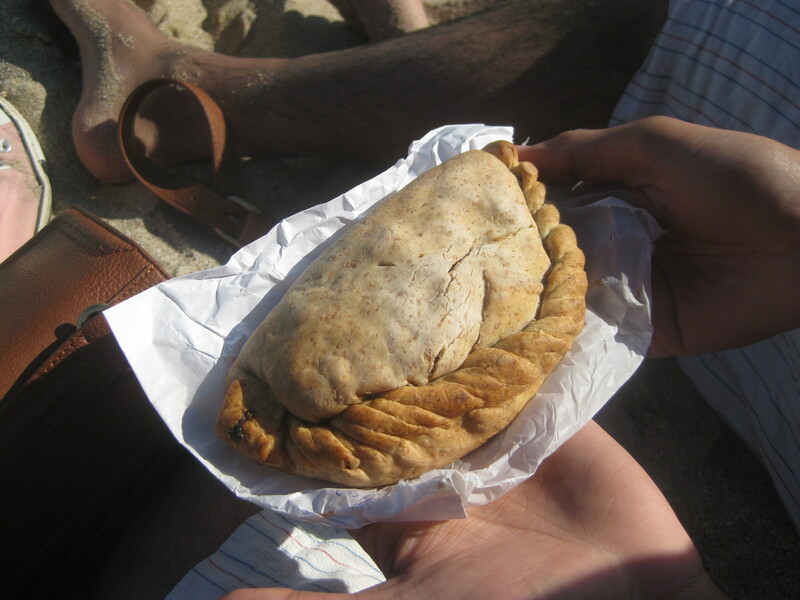 Still to come: another pasty! A very good cake! Pancakes! This entry was posted in Travel and tagged King's Pipe Pasties vegan, The Polgooth Inn vegan, vegan Cornwall, vegan pasties, vegan travel, Wildebeest Falmouth. Bookmark the permalink. I love Cornwall, but I found it was also more lacking on the vegan front than I expected – I think I only managed a single vegan pasty when I was down there. I’m glad you had more success – that cheesecake it totally a winner. I found a second vegan pasty, but it was definitely harder to get by than I would like. I think when I go back, I’ll mainly go to Wildebeest again!